Select from a wide variety of colors or send us a logo along with the information to print, and we’ll make sure you get your Customized Manual Three on Page Business Checks at your doorstep in the shortest time possible. Don’t forget: large orders – great discounts! My entire order was great! fast shipping and great customer service! We received the checks in a timely manner and they work great for my business. very neat and up to date. Thanks for your great customer service. everything in my order is great! thank you! Thank very much for the email. Everything worked out great! We will be ordering in the future. My checks arrived fast and just as ordered! Thank you! Checks look great and got here fast! 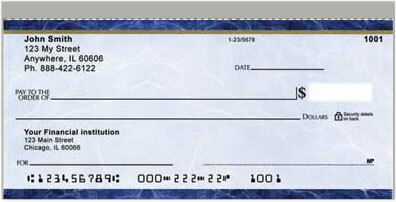 These checks work perfect for my small business. Great Quality, and fast delivery! The checks have a great look to it!